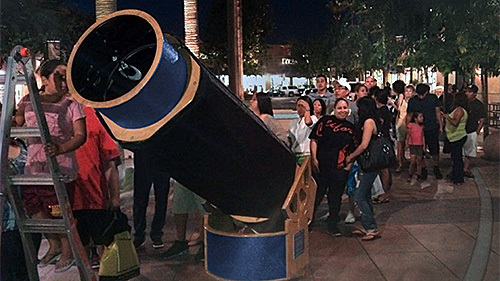 A great opportunity to see some telescopes and view the moon and planets, our River Park Sidewalk Star Parties offer a fun way to observe and meet members of the club. These events typically begin at sunset and last until about 10:00pm. We set up in the "Via la Plata" street directly behind the REI building, straight out from Edwards Theatre. The River Park star parties are scheduled every month of the year from March until October. They generally start at around sunset and go until 10:00pm. Because of the extraordinary amount of light at River Park, our observing is generally limited to the moon and any planets that happen to be up. We time the events to coincide with dates that the moon will be viewable. These star parties can get very crowded - we have had nights with 500+ people stopping by. Please be patient and courteous to the guests around you.